PRONG Premiere New Single "Cut And Dry"
American Power Trio PRONG will release their new album X-No Absolutes on February 5th via SPV/Steamhammer. Today, the second single from the album, "Cut And Dry", has been released and you can check it out below. 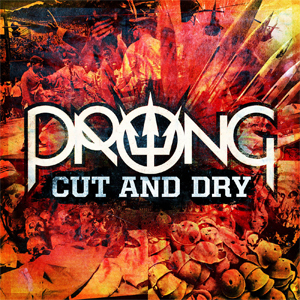 "I think you'll find our new single "Cut And Dry" one of the most hard hitting and intense tracks PRONG has ever released. It surely represents the pummeling fashion of our newest full-length album X - No Absolutes which is released next week, February 5th. It's also the first track we've ever done that has a dueling solo, where Dane Markanson of Glass Cloud and I trade riffs. I believe the lyric is timely, in accordance with No Absolutes, addressing a climate of total insecurity. Check out this sharp new PRONG. "Cut And Dry". It dices and slices!" The new album will be released worldwide through SPV/Steamhammer on February 5th, 2016 as digipak (incl. bonus track + sticker), 2 LP Gatefold version (red vinyl, CD in paper sleeve) and download. X-No Absolutes is PRONG at their very best. The sheer intensity and ferocity of the albums opening triumvirate "Ultimate Authority", "Sense Of Ease" and "Without Words" leaves the listener gasping for air. The title track is crunchy and catchy at the same time. "Do Nothing" may be as close as you will ever hear PRONG get to a ballad and shows the enormous progress and confidence Victor has made vocally. It is hard to find a weak spot here, notably Victor mentions that "sequencing the album was a difficult task; every song is so strong in it's own way". Again produced by Tommy Victor, this time with trusted collaborator Chris Collier as co-producer and engineer, X-No Absolutes also broadens the horizon sonically.